Written with a Rohrer & Klingner glass dip pen on Maruman Smooth-To-Write paper. My favorites this month are the Shin-Ryoku and the Poppy Red (reviews to follow). 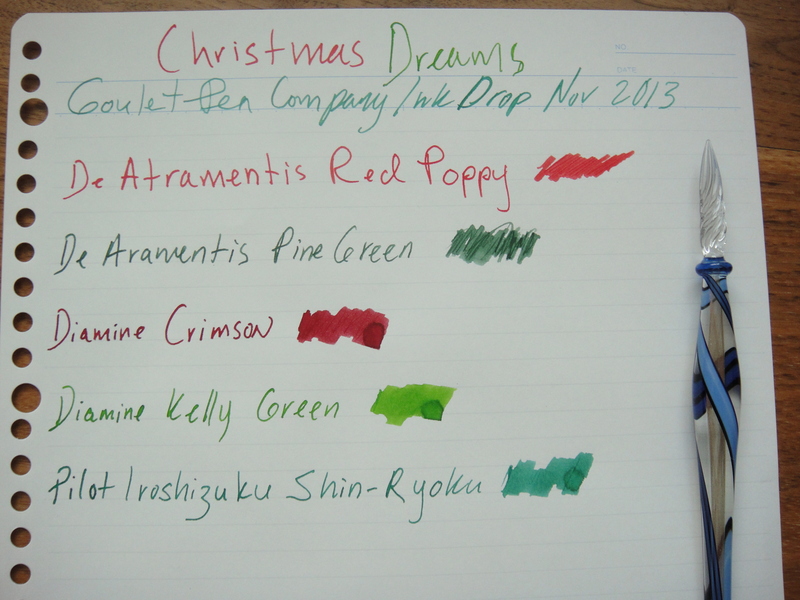 From my quick first impressions none of these inks are a buy for me. The Shin-Ryoku looks amazing when wet but it becomes a little dull when dried; it’s very similar to J Herbin Lierre de Sauvage which I think has a little bit more character and is cheaper to buy. Ink Drop is a subscription service through The Goulet Pen Company (no affiliation) that consists of monthly shipments of 5 ink samples. Each shipment is $10.